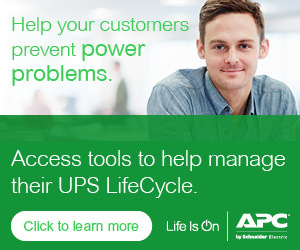 APC by Schneider Electric wants to be Your Trusted Partner in Education. We know that your K-12 customers in particular are faced with short buying seasons and limited funding. Let us help you make it easy! E-Rate Opportunity Approvals and Instant Stackable Discounts. Meanwhile your K-12 customer is provided a solution that is Trusted & Innovative as APC is the Market Leader in single phase UPS & Enclosures and has a Rich History of Pioneering the Power Protection Industry. Read our K-12 Blog Posts to Learn More! The financial incentives mentioned above are only available in the United States.